I’ve had this recipe for a while now (that I saw on Deb’s FABULOUS blog, Smitten Kitchen, who’s daily emails I get, read and love), and I’ve wanted to bake them for equally as long, but just never got around to it, until yesterday, see…being bored can lead to yummy good things. 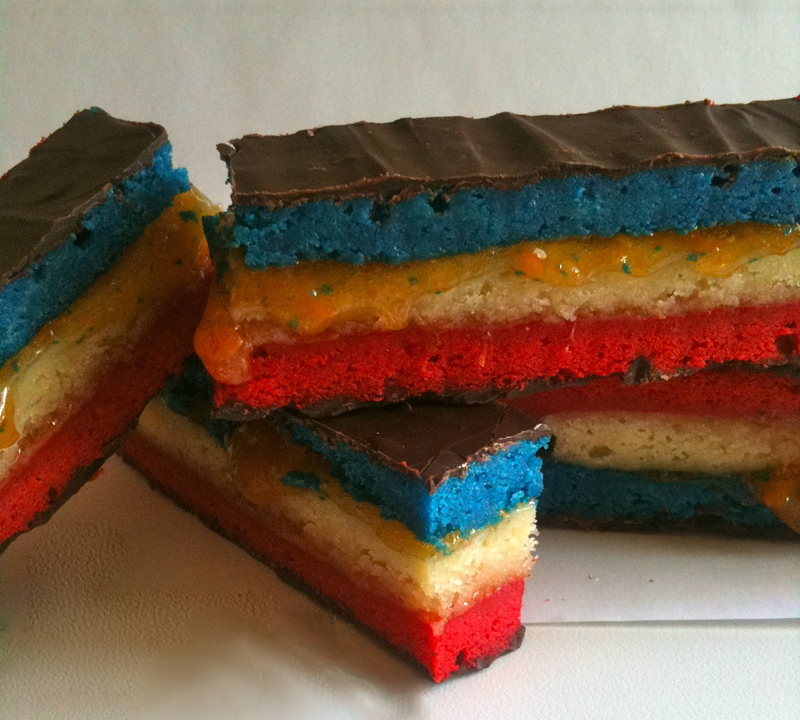 These 7 Layer Cookies are also known as Rainbow Cookies, call them what you will, but just know they’re gooooood. They’re typically red, white and green, which I *think* is because it’s an Italian thing, BUT I’m not Italian, and I didn’t want to make German colored cookies, so I took to my homeland and made them RED, WHITE, & BLUE…good ‘ol USA!! Don’t try to make these if you need them that night, unless your up EARLY, they’ll need about 11-12 hours total, between the baking, cooling, layering, they cooling again, and layering with chocolate. ~Put oven rack in middle position and preheat oven to 350°F. Butter a 13- by 9-inch baking pan and line bottom with wax paper, leaving a 2-inch overhang on 2 ends, then butter paper. 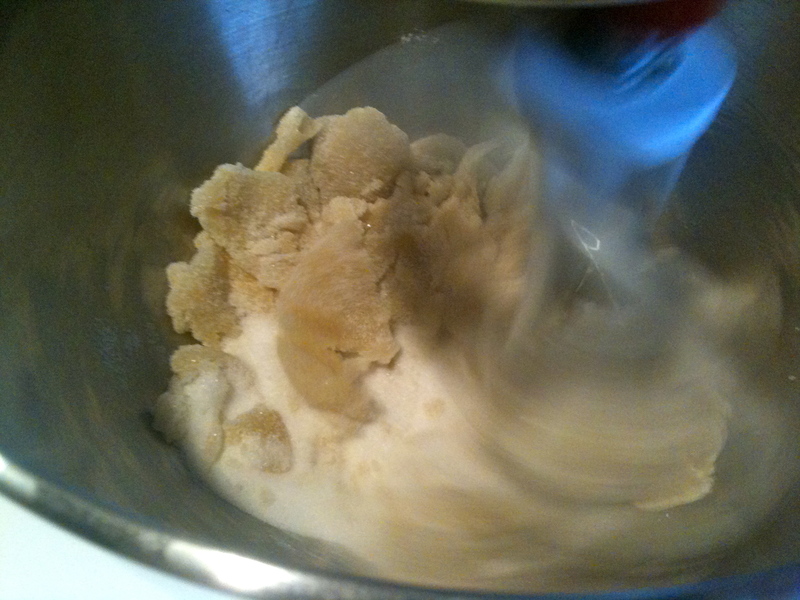 ~Beat whites in mixer fitted with whisk attachment at medium to high-speed until they just hold stiff peaks. Add 1/4 cup sugar a little at a time, beating at high speed until whites hold stiff, slightly glossy peaks. 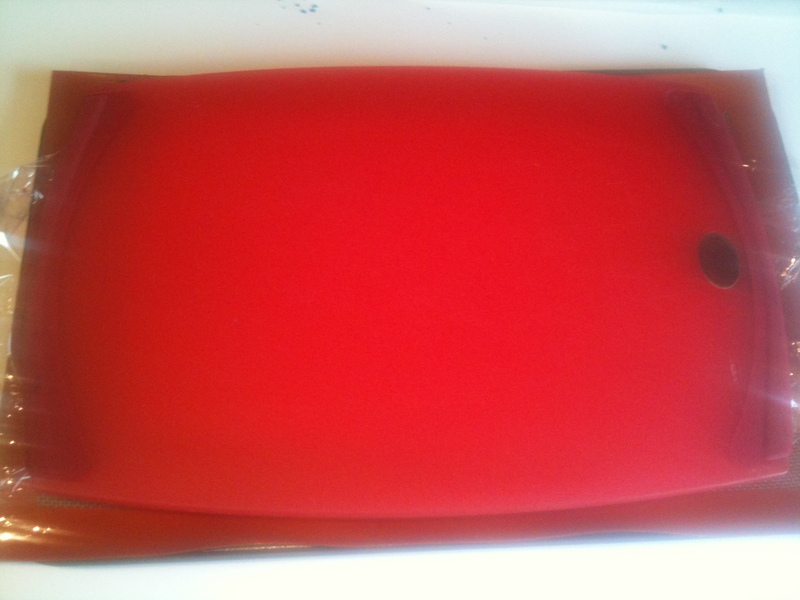 Transfer to another bowl. 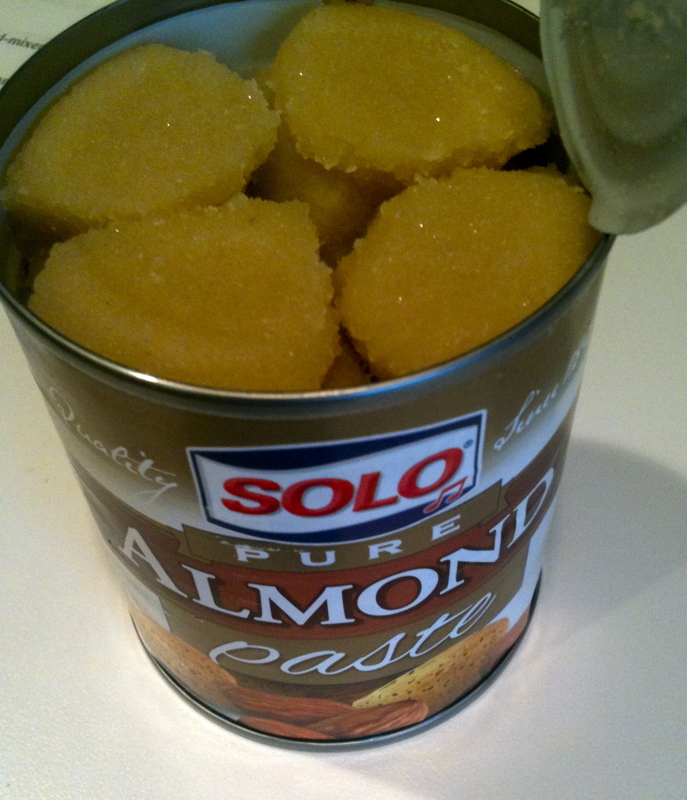 ~Switch to paddle attachment, then beat together almond paste and remaining 3/4 cup sugar until well blended, about 3 minutes. Add butter and beat until pale and fluffy, about 3 minutes. Add yolks and almond extract and beat until combined well, about 2 minutes. Reduce speed to low, then add flour and salt and mix until just combined. 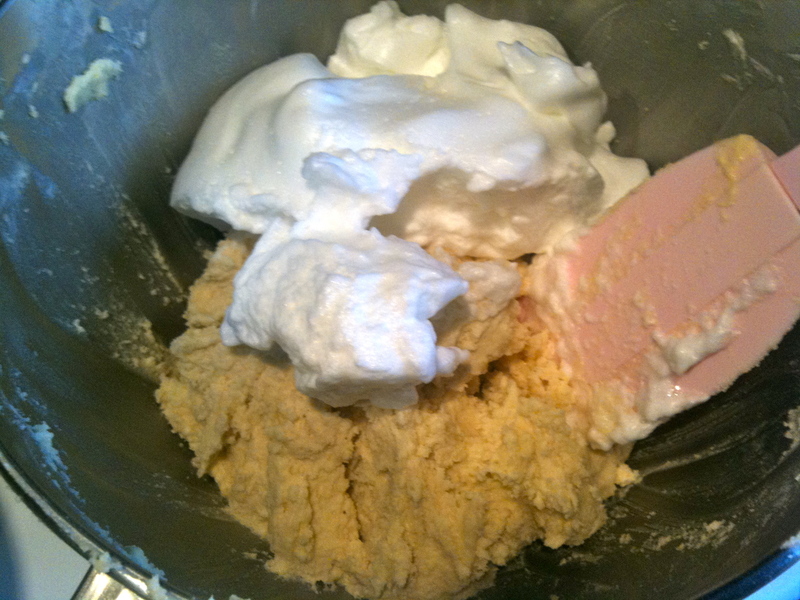 ~Fold half of egg white mixture into almond mixture to lighten, then fold in remaining whites gently but thoroughly. ~Divide batter among 3 bowls. 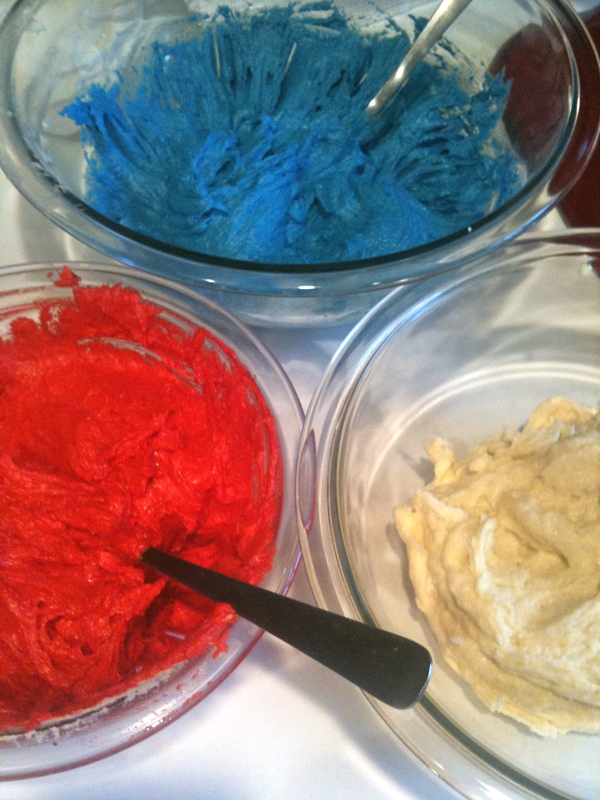 Stir red food coloring into one and blue food coloring into another, leaving the third batch plain. Set white & blue batter aside. 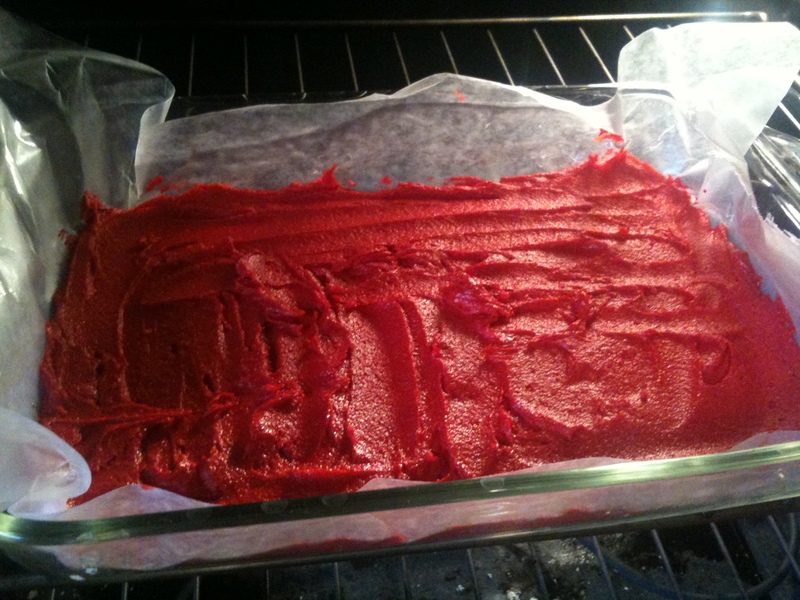 Pour red batter into prepared pan and spread evenly with offset spatula (layer will be about 1/4 inch thick). ~Using paper overhang, transfer layer to a rack to cool, about 15 minutes. Clean pan, then line with parchment or wax paper and butter paper in same manner as above. Bake white layer in prepared pan until just set. Transfer white layer to a rack. 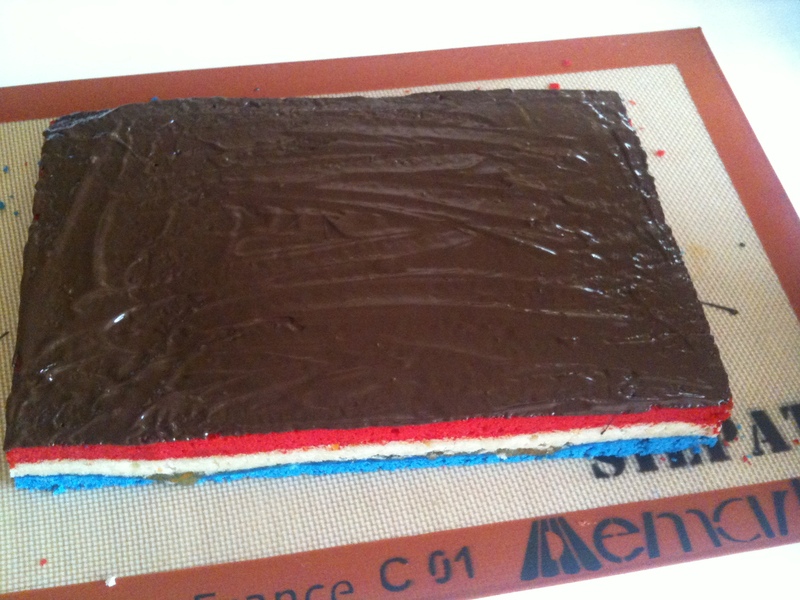 Prepare pan as above, then bake blue layer in same manner as before. Transfer to a rack to cool. 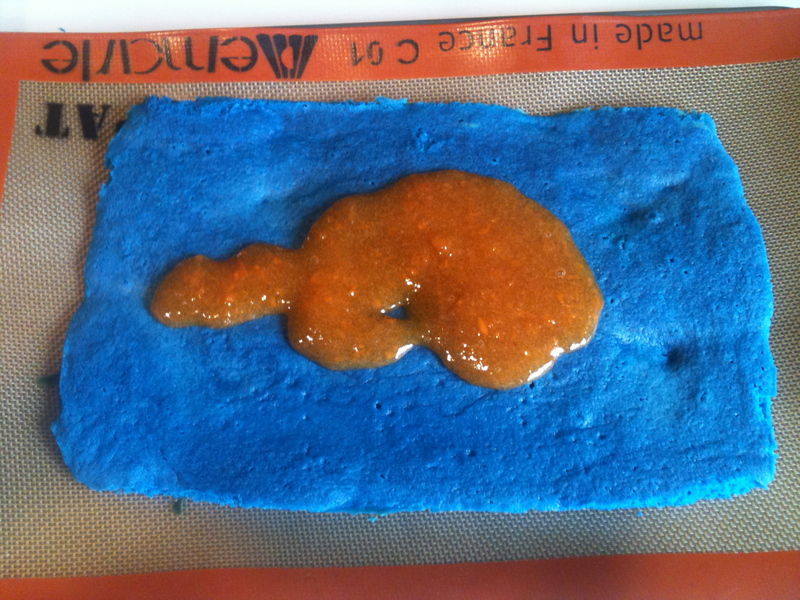 ~When all layers are cool, invert blue onto a parchment or wax-paper-lined large baking sheet. Discard paper from layer and spread with half of preserves. Invert white on top of blue layer, discarding paper. Spread with remaining preserves. Invert red layer on top of white layer and discard wax or parchment paper. ~Cover with plastic wrap and weight with a large baking pan. Chill at least 8 hours. ~Remove weight and plastic wrap. Bring layers to room temperature. ~Melt chocolate in a double boiler or a metal bowl set over a saucepan of barley simmering water, stirring until smooth. Remove from heat. Keep chocolate over water. ~Trim edges of assembled layers with a long serrated knife. 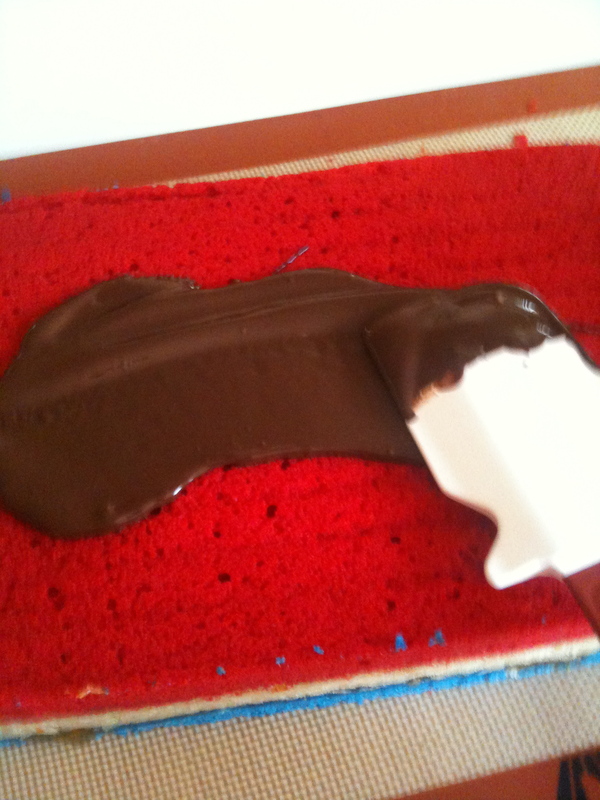 Quickly spread half of chocolate in a thin layer on top of cake. Chill, uncovered, until chocolate is firm, about 15 minutes. ~Cover with another sheet of wax paper and place another baking sheet on top, then invert cake onto sheet and remove paper. Quickly spread with remaining chocolate. Chill until firm, about 30 minutes. ~Cut lengthwise into 4 strips. Cut strips crosswise into 3/4-inch-wide cookies. 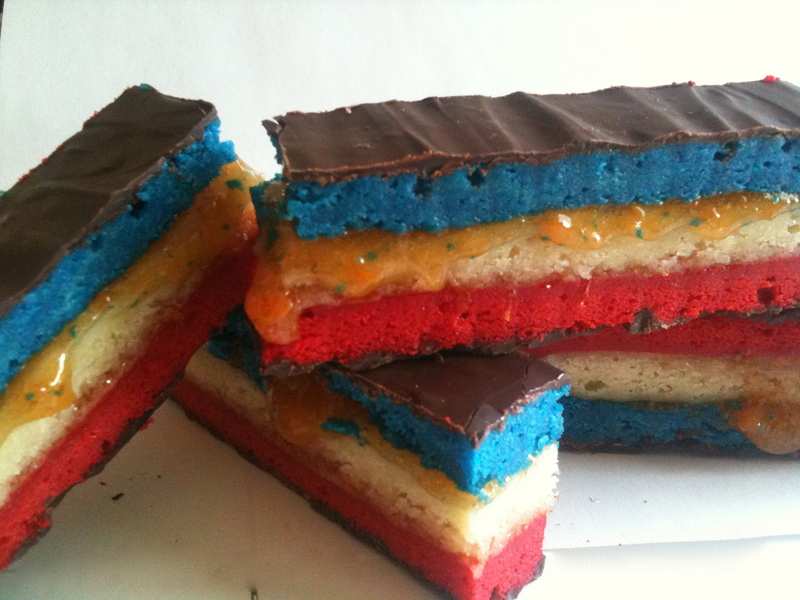 Categories: Baking, Chocolate, Cookies, Fruit, Italian Food, Nuts | Tags: 7-Layer cookies, almond paste, chocolate, Cookies, italian cookies, jam, rainbow cookies | Permalink.